The “1000 Club” was founded in 1978 as a fundraiser for Our Lady of the Assumption Parish. Over the years, it has raised money for the benefit of a variety of parish needs, and as of January 2018 the OLA School will now run the 1000 Club to help benefit the school. The process is simple. Purchase an available number between 001 and 999. You can choose a number that is lucky or meaningful to you! Once a month – usually on the third Sunday during “Coffee Sunday” at OLA’s Church Hall – the wheel is spun to pick the lucky winning numbers. Two $500, one $400, one $300, one $100, and four $50 winners are possible. If after two spins, the winning numbers have no corresponding purchaser, the prize is retained by the Club. You can click on the link to see available numbers and the most recent winners. 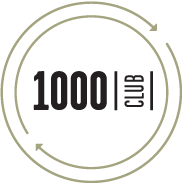 You can join the “1000 Club” for $60/year. Contact the School at 781-599-4422 for more information or to become a member.